A kitchen utensil used to cook, sterilize, and preserve low acid foods that are to be canned for future use. The pressure canner is a device which may also be referred to as a pressure cooker but should not be confused for use as a small pressure cooker that is used to cook foods, not preserve foods. 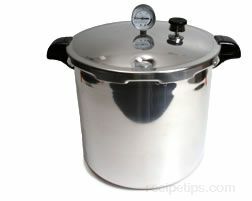 A small pressure cooker should not be used as a pressure canner but a pressure canner may, for some foods, be used as a pressure cooker for preparing cooked foods. As an example, soups and stews can be pressure cooked in a canner, but can only be cooked in amounts that fill half or less of the canner. Similarly, meat and poultry can be pressured cooked in a canner if the amount is typically slightly less than two thirds of volume of the pot. For safety purposes, always read and follow the directions of the pressure canner manufacturer to insure that procedures and processes will not result in injury or illness. A pressure canner generally consists of a steel or cast aluminum pot, a locking lid with an airtight seal and vent cover lock, a vent pipe with a pressure gauge, and an excess pressure lid plug. The locking lid mechanism is a safety mechanism that keeps the lid from being opened until the pressure within the canner is removed, while the airtight seal and vent cover lock keeps the pressure contained within the pot or releases excess pressure through the vent pipe as the pressure gauge and regulator display the pressure reading. The lid plug is also a safety feature that allows excess steam to be released if the vent pipe becomes plugged unexpectedly. The air within the pot is heated to a very high temperature (well above the boiling point), allowing air pressure and steam to build inside forcing hot steam through the food to cook and preserve it thoroughly. Pressure canners are used for canning and preserving foods that need to be heated to very high temperatures only achieved by creating steam with pressure so the contents can be safely sealed air tight in glass containers. Canning jars filled with food contents are placed on a metal rack that rests on the bottom of the canner. A typical canner will hold 17 to 19 pint jars or 6 to 7 quart jars of food with an overall capacity of 18 to 22 quarts. Several inches of water is placed in the canner pot which is then used to heat and create the steam and the process begins. Pressure canners allow nutrients and flavors to be retained and higher temperatures to be achieved with the steam in order to eliminate potential bacterial dangers when fruits, vegetables, meats, seafood, poultry, milk, and a variety of prepared foods are preserved using this method.